Yesterday we held the first Heritage Championship event for 2019, and it was a huge success. We had over 170 golfer grace our beautiful golf course to partake in the event. And thank you to the Members and Visitors for your support. Well done to the winners and good luck to the winners going through to the final in September. Join us this Sunday, 10th March 2019, for a Family Fun Day. - Food & Beverages, Cheeses, Flowers, Bakes Goods, Popcorn & Candy Floss on sale and a Ice Cream Truck. See you and your family on Sunday. Who will be our 2019 Club Champion? With our flagship event just around the corner, I hope that you are ready for an exciting weekend of golf. We are ready for you. 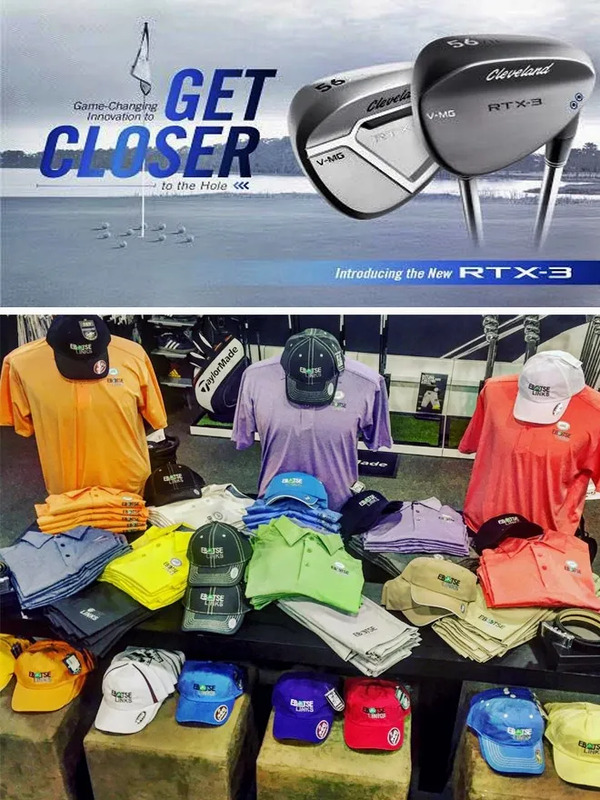 Read more in our latest newsletter: http://bit.ly/2U79SsC With our flagship event just around the corner, I hope that you are ready for an exciting weekend of golf. We are ready for you. 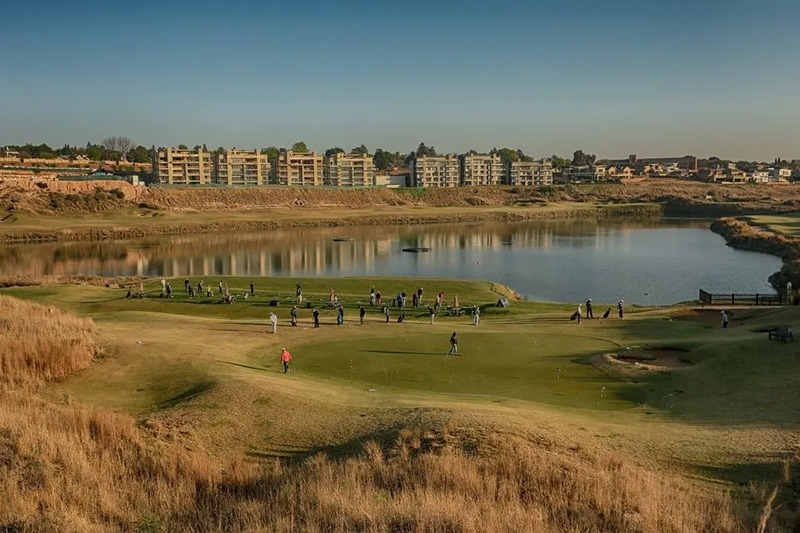 This past weekend, Saturday, the 16th of February 2019, we hosted Centurion CC, Woodhill and Silver Lakes at Ebotse Links in a Gauteng Matko Challenge. The golf clubs were all split up amongst each other and the format was a Betterball Stableford. Ebotse came in first with with 6.5 points! The PGA Championships at Eye of Africa tees off tomorrow, Thursday 31st January 2019. Kevin Edwards and I are looking forward to an unbelievable experience, as we tee it up amongst South Africa’s top Sunshine Tour Pros and several fellow PGA Pros. The field is 156 strong, with a prize fund of R2 Million. We look forward to flying the Ebotse Links flag high. On Friday 23rd of November, we attended the EGU Presidents Dinner at Benoni Country Club. This event is held every year and it is when all the awards get handed out. Read more here: http://bit.ly/2Piplml On Friday 23rd of November, we attended the EGU Presidents Dinner at Benoni Country Club. This event is held every year and it is when all the awards get handed out. This past weekend was an action packed weekend of sports and entertainment. http://bit.ly/2Q0h0rO This past weekend was an action packed weekend of sports and entertainment. Join us on the 7th December for a 6Ball Commando Challenge. Green Fees, Carts, Halfway House, Snacks and Prizes are all included. 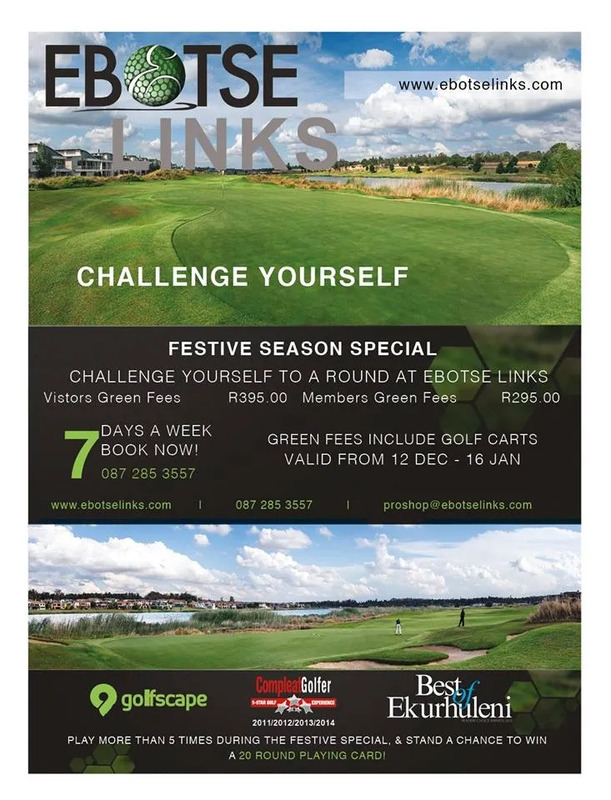 Book now with Dean Kupferman - golfdirector@ebotselinks.com Join us on the 7th December for a 6Ball Commando Challenge. On Tuesday 16 October, we held our Annual Ebotse Ladies Day. We had 92 ladies play on the day, and they all came dressed up in “flower power” style! This was the theme for the day, and as you will see by the pictures that follow, it was a bright and colorful day. Thank you to all the ladies who participated, we have had only good feedback from the day, and we look forward to having you back in 2019. A special thanks must go to Lynda Smit (Ladies Captain) and Deirdre Botha (Lades Vice-Captain) (pictured here), for a well-organized event. Well, we have finished with our 2nd annual course improvement plan for 2018. We have gone with the small tine at 8mm on the greens as you can see by the pictures. The greens are still playable as you can see on the following link, the ball still rolls smoothly. The greens are running at 9.5 on the stimpmeter. It may assist a few players with the slower pace to putt a few less times on our greens. http://bit.ly/2QKMTkX Well, we have finished with our 2nd annual course improvement plan for 2018. We have gone with the small tine at 8mm on the greens as you can see by the pictures. I’m sure many of you are just as excited as I am for this weekend of golf. The world's best golfers competing against each other, on one of the worlds most amazing golf courses. Read our newsletter here: http://bit.ly/2R4eDlH I’m sure many of you are just as excited as I am for this weekend of golf. 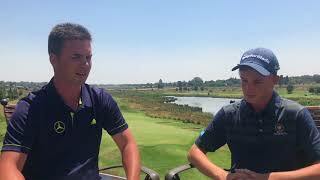 I had the pleasure of playing golf on Thursday 13 September with Arno De Wet. He was visiting us from Cape Town, and as it was his birthday, he joined us in our Thursday School. What made this day even more special, was his first ever hole-in-one on the 15th Hole! 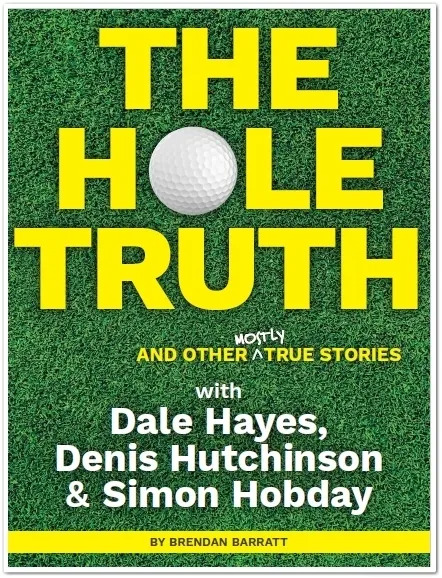 It was the perfect shot, as he used his Pitching Wedge from +-130m, straight into the hole, a slam dunk. Well done Arno De Wet, it was an absolute honour to have experienced that moment with you. Our league teams are taking down the competition! A huge congratulations must go to our 3 league teams, for managing to finish top of their respective sections and advancing through to the finals. The finals will take place in October and November, and we will keep you all updated on when and where they will be playing. Thank you to every single member that represented us this year in league, we appreciate the commitment given to the club to participate in the leagues. Bring home the trophies gents. 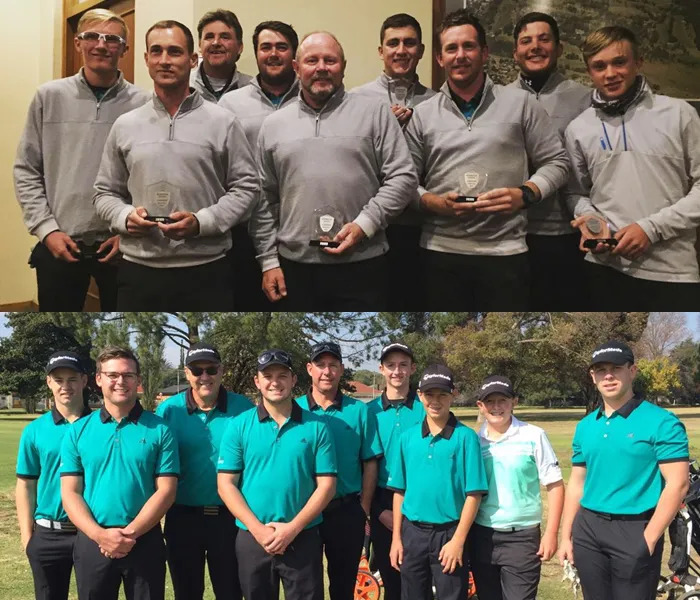 http://bit.ly/2Qlk0g1 A huge congratulations must go to our 3 league teams, for managing to finish top of their respective sections and advancing through to the finals. As you may know, there is a National Golf Day on the 3rd of September 2018. The new Handicap System is also kicking off and we tell you everything that you need to know for this big change. All the details of our upcoming AGM are in this week's newsletter. We also have a jam-packed calendar ahead, and two ball specials in the shop if you need to stock up. Read our newsletter here: http://bit.ly/2w6bxF1 All the details of our upcoming AGM are in this week's newsletter. We also have a jam-packed calendar ahead, and two ball specials in the shop if you need to stock up. Join us on a Tuesday for only R250pp (Green Fee and Golf Cart). 20% off on pizza/burgers after golf. Book with us now on 0872853557. Remember we need to send you access codes for your entrance into the estate. Join us on a Tuesday for only R250pp (Green Fee and Golf Cart). Are you ready for the implementation of the new Handicap System? Find out more in this weeks newsletter article. Thank you to everyone that supported us yesterday, in the Sanlam Cancer Challenge. All prize may be collected from the Pro Shop during the week. The winners of each division will go through to the regional finals at Reading Country Club. The regional finals will take place on the 25th August. Ebotse vs Benoni | Who came out on top? The Open Championship is here. Who's your pick? Great things happening with Golf Champs this #TheOpen? ?week. I have entered and so should you! Great things happening with Golf Champs this #TheOpen? ?week. A jam-packed June in every possible way! Join us this June - August for our Winter Special. This includes your green fees and golf cart! Book your next round with us today, call Pro Shop on 087 285 3555/7 or visit www.teesheet.co.za! Regards, Join us this June - August for our Winter Special. We will be hosting a Vokey fitting day on Friday, 25 May 2018 from 09:00 - 10:30. The experts from Vokey and our pros will be there to help you find the perfect wedge for your game. And it's completely free! Limited spots available. Save the date for our 1st Inaugural “Boere vs Souties” event. We are planning to host this on the 16th June 2018. We did a Q&A with some of our elite members just before Club Champs 2018. Jaco Rall - defending champion and multiple club champion. Jayden Schaper - #1 ranked junior in SA and currently 14th in South Africa for open amateur. 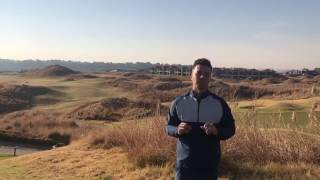 Jordan Burnand - #31 ranked amateur in South Africa. To all playing the Club Championships this weekend, the very best of luck, have fun and may the best golfer win! Dean and the team We did a Q&A with some of our elite members just before Club Champs 2018. Beat your handicap and score! With Club Championships just around the corner, what better way to challenge yourself than standing a chance to stock up on golf balls! Purchase a dozen of your favourite Srixon golf balls (at a 10% discount!) prior to Club Championships, tee off with this bargain buy, beat your handicap and score! What's up for grabs? A dozen FREE of the golf balls that you originally purchased! Beating your handicap has never been this rewarding. Have you got what it takes? We made some Ebotse Golfers VERY HAPPY last week! This year, TaylorMade introduces a new range that reaches new thresholds of performance. 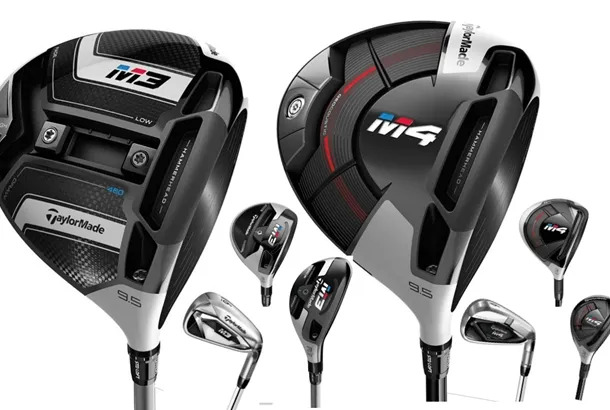 With the revolutionary Twist Face Technology, the M3 and M4 clubs give golfers a tangible competitive advantage. The result is a consistent driving performance consisting of power, forgiveness, and accuracy. Join us on 3 February 2018 from 08:00 - 14:00 to see what this can mean for your game. Call us on 087 285 3555 to book your spot. Our League Fundraiser Day is taking place this Saturday, so all comps will move on 1 weekend. Well it's nearly time for the 146th Open Championship, at Royal Birkdale, Southport, Merseyside, England. A- Who you think will win? B- What the winning score will be? Comment, Like and Share our page with all your friends so they don't miss out on this opportunity either. The winner will receive a complimentary 4-Ball with golf carts at Ebotse Links. Join us tomorrow for our Power Play Golf Event. Call 087 285 3555 to book your spot. Join us tomorrow for our Power Play Golf Event. Call 087 285 3555 to book your spot. Thank you to TaylorMade who will be sponsoring the fantastic prizes for the event. I was fortunate enough to be at the TaylorMade launch and we got some nice 2017 wishes for all our valued members. 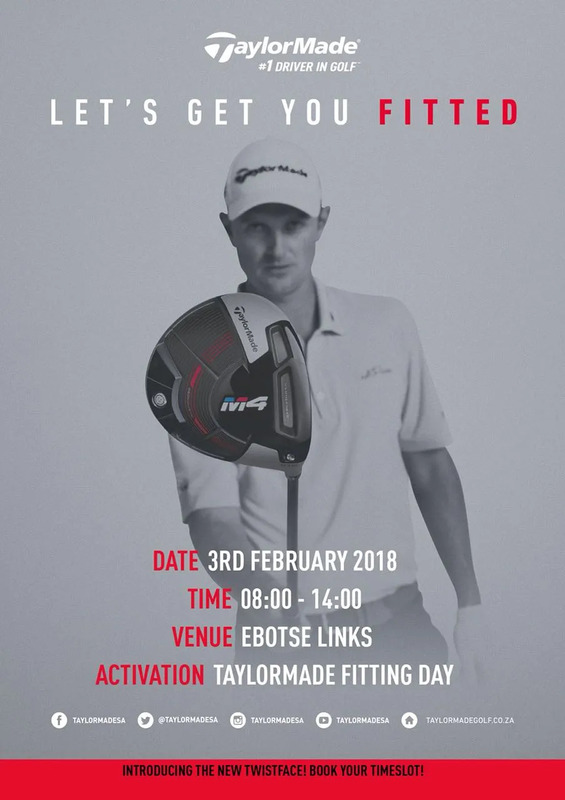 We will have the latest TaylorMade equipment in store soon so watch this space for more information if you would like to get fitted or contact us. 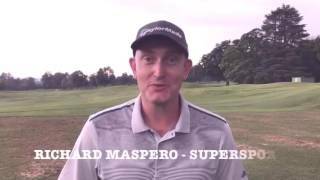 Watch the video here: http://bit.ly/2jaiu28 I was fortunate enough to be at the TaylorMade launch and we got some nice 2017 wishes for all our valued members. Look out for our Festive Special from the 12th Dec 2016 - 16 Jan 2017. We will be open 7 days a week. Contact 087 285 3557 and make your booking now. Play 5 times or more during the Festive Special season and stand a chance to win a 20 Round Playing Card. T's and C's Apply. From everyone here at Ebotse Links we wish all our valued members and visitors a safe and happy festive season. We've got some exciting plans in the new year, so make sure you keep posted on all our social media platforms!! We hope to see you on our fairways this Festive Season. Look out for our Festive Special from the 12th Dec 2016 - 16 Jan 2017. We will be open 7 days a week. Contact 087 285 3557 and make your booking now. FREE Ball Personalisation at Ebotse Links! Get FREE ball personalisation when ordering a dozen TaylorMade TP/TPX or Titleist Pro V1/V1X at only R450 per doz! 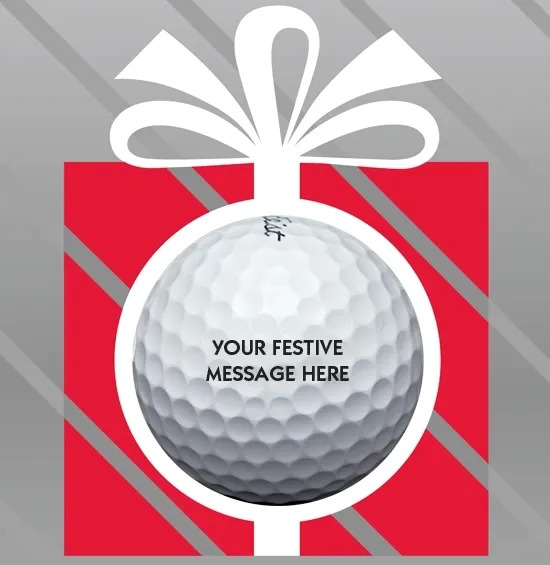 Follow this link to complete your order - https://bit.ly/2gOg20L Get FREE ball personalisation when ordering a dozen TaylorMade TP/TPX or Titleist Pro V1/V1X at only R450 per doz! 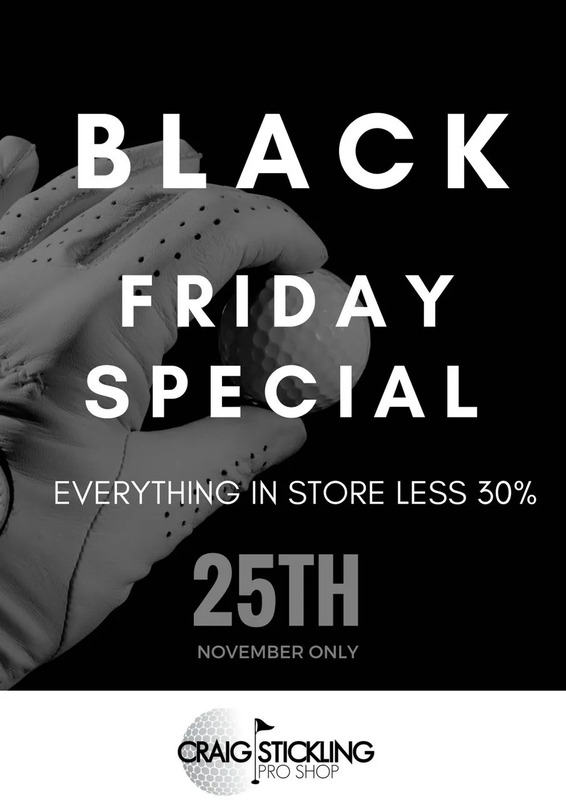 Black Friday Special - Everything in store will be less 30% tomorrow! Find the perfect Christmas gift for your loved one or simply come and spoil yourself! Find the perfect Christmas gift for your loved one or simply come and spoil yourself! 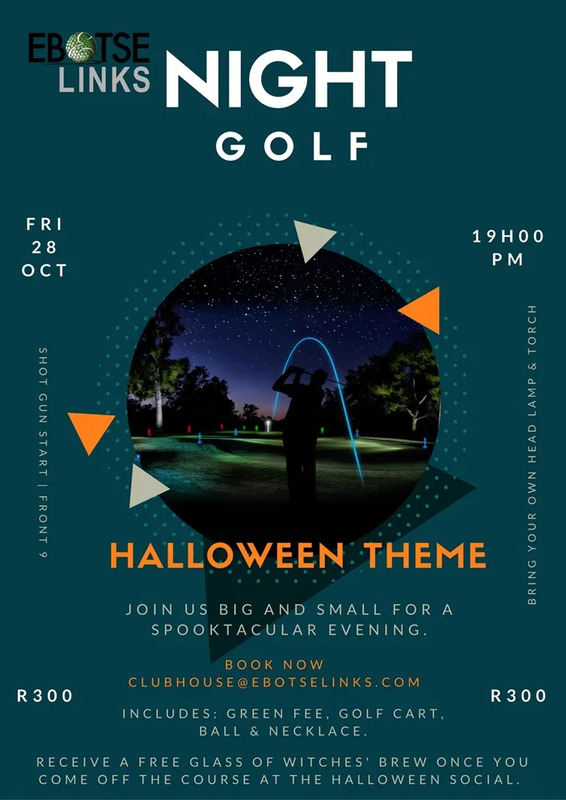 SAVE THE DATE - Friday 28 October - NIGHT GOLF! Come and join us for a fun night golf event! See all the details in the poster below. 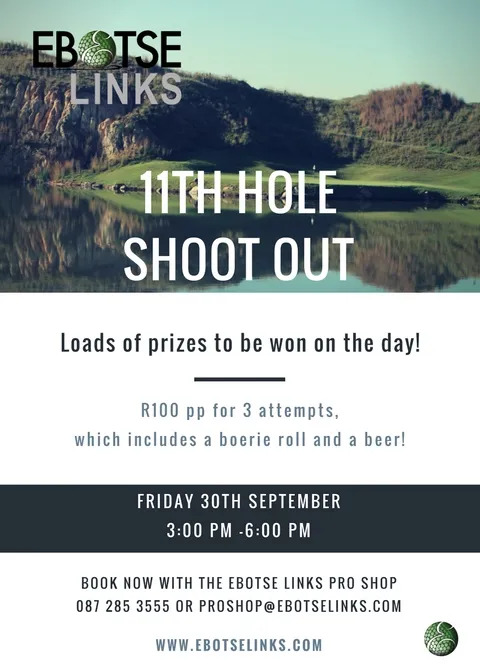 To book email clubhouse@ebotselinks.com Come and join us for a fun night golf event! See all the details in the poster below. Turn your adidas purchase into cash and what's coming up in October! To enter is extremely easy. For every R800 spent on adidas Golf apparel and footwear is 1 x entry to win R50 000 cash. This is a huge prize and probably one of the biggest ever offered in the golf industry locally. What's coming up in October at Ebotse? Have a look at the Ebotse events poster below. Loads of prizes to be won on the day. R100 PP for 3 attempts which includes a boerie roll and a beer! Join us between 3:00 and 6:00 PM! 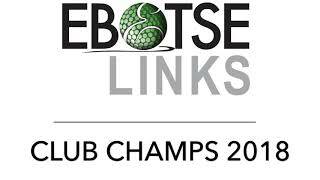 Book now with Ebotse Links Pro Shop 087 285 3555 or proshop@ebotselinks.com Loads of prizes to be won on the day. 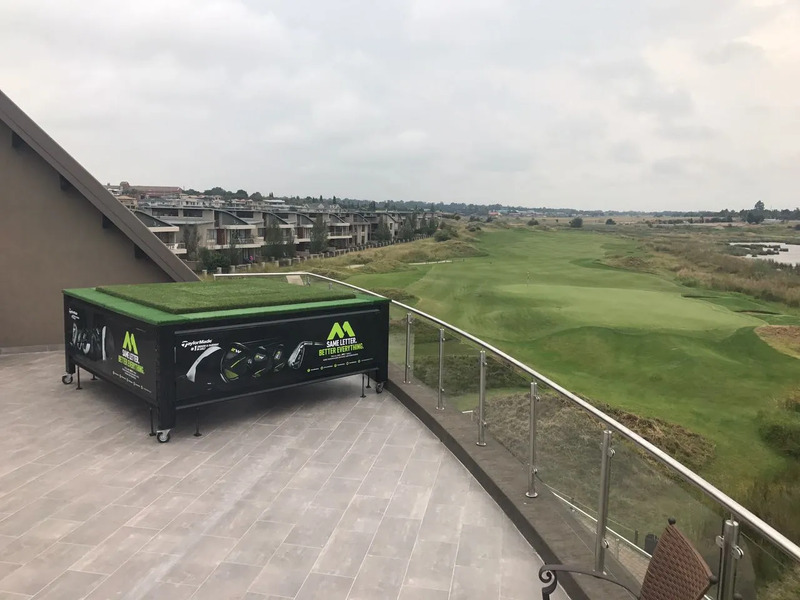 It's moving day at Ebotse Links! All New Ebotse Links Logo Apparel from AHEAD Golf South Africa just arrived for Summer! A must for any Member or Visitor playing here! A great read. Your chance to buy now! I gives me great pleasure to inform all our valued members and guests that our Scratch League Teams did exceptionally well this year, with the A Div Team winning and the B Div Team finishing in 2nd place. 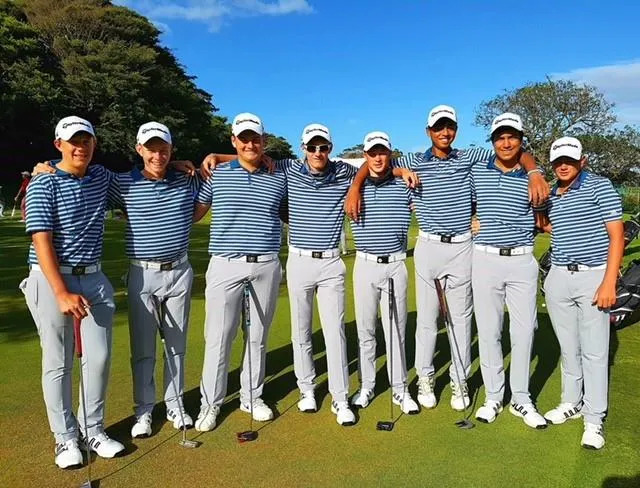 Both Teams fielded a few young and upcoming players, so the state of Golf at Ebotse is looking very good for the future! Well Done to Dean Kupferman, whom managed the A Div side, Rob Mackenzie whom managed the B Div side - and all the players, we are very proud of you! This putter will not be for sale but all TaylorMade /adidas sales during the month of June will go into the draw to win the putter! 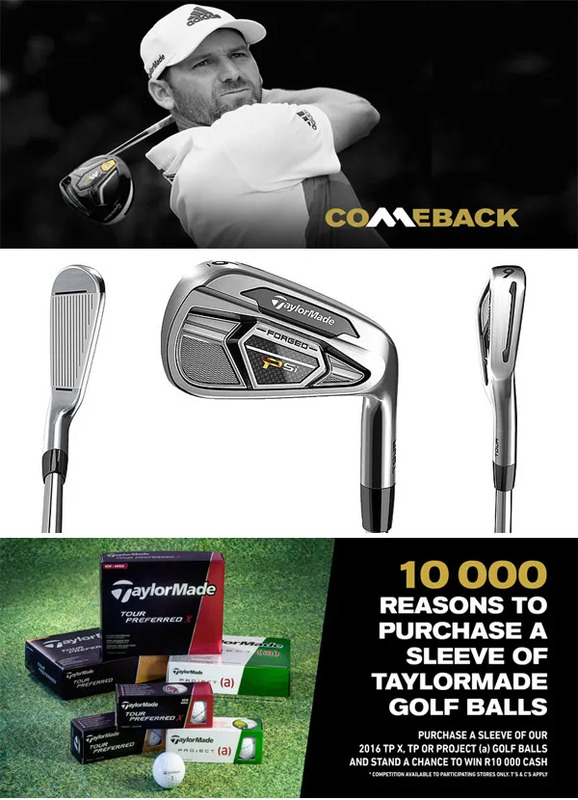 Remember if you purchase sleeve of TaylorMade golf balls you go into the draw to win a R10 000 cash prize.